Hundreds of possible ways it could end. With "Breaking Bad" careening toward a climax Sunday night, fans of the AMC show -- newly anointed by Emmy voters as the best drama on TV -- are feverishly doing the plot-resolution math. The Internet is buzzing with potential clues, predictions and crazy theories as viewers debate the most fitting way to send teacher-turned-drug-lord Walter White into the Albuquerque sunset. Which characters will survive? Will Walt die, and how? Who is the vial of ricin, and the machine gun in his trunk, meant for? What will become of wife Skyler, son Walt Jr., sister-in-law Marie and -- most pressing of all -- Jesse, his tormented ex-partner in crime? Cryptic comments by Vince Gilligan, the show's creator, have only stoked the speculation. "We worked long and hard to ensure that ... the very last episode — would satisfy an audience," he told Entertainment Weekly. "I am guardedly optimistic that we have achieved just that. And furthermore, trying to be as coy as possible, trying to give away as little as possible, I feel like this ending represents on some level, however small, something of a victory for Walter White. "Read into that what you will. And try to be as open-minded as possible when you watch this episode, because it may not indeed feel like a victory. Or maybe it will." This one is the most obvious, and therefore the most unlikely. Walt shows up at Uncle Jack's compound, seeking his stolen money, and somehow takes out Jack, Todd and the rest of the neo-Nazi thugs -- either with a surprise hail of bullets or a stealthy dose of poison. Uncle Jack and his nephew Todd, the world's most polite psychopath, are likely in Walt's sights. In the process, he also frees Jesse, who either is a) so grateful to be sprung from his hellish existence as a meth-cook slave that he walks away, or b) so angry that he kills Walt right there, extracting a measure of revenge on the "mentor" who ruined his life. 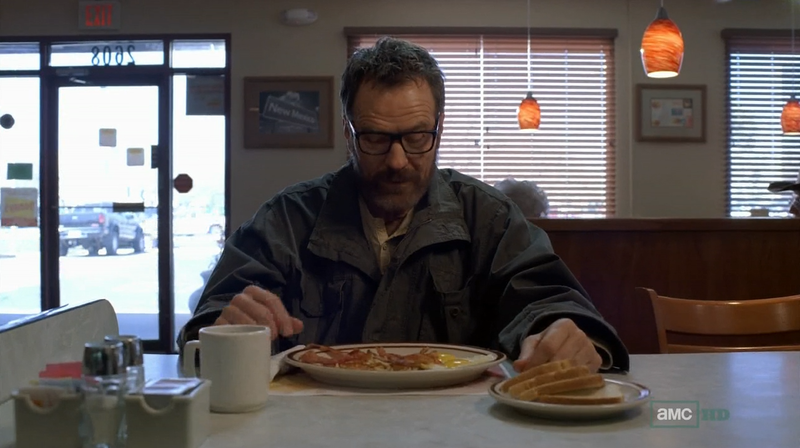 Despite its comic moments, "Breaking Bad" at its heart is an epic tragedy with a high body count. In some ways it would be true to the show's dark heart if things end bleakly for almost everyone: Walt's attack on Uncle Jack goes wrong, he and Jesse are killed and Skyler goes to prison or commits suicide, orphaning Walt Jr. and Holly and leaving Lydia free to go on supplying Europe with crystal meth -- Walt's last, bitter legacy. Some fans of the show think Walt got so worked up watching Elliott and Gretchen Schwartz -- whose lucrative Gray Matter pharmaceutical company may have been rightfully his -- on "Charlie Rose" at that bar in New Hampshire that he's been jolted into seeking some long-repressed revenge. He sure bolted from the bar in a huff. But why would he need an automatic weapon to confront a couple of scientists? Besides, such a quest would distract from bigger potential showdowns with other characters. Oh, how Marie hates her brother-in-law. It wouldn't be a shocker to see Walt survive a showdown with Uncle Jack and crew, only to be blindsided by another antagonist. We're going to assume that Walt Jr. -- about the only unsullied character left on the show -- is not going to suddenly break bad and kill his old man. But Skyler has had a lot of time to see about how Walt destroyed their family and left her facing a prison sentence. As we've seen, Lydia is not above some ruthless maneuvers to protect her interests. And then there's Marie -- poor, grieving Marie -- who now hates Walt to the core of her widowed soul and may want to avenge Hank's death. Sunday's final episode is titled "Felina," which has sent the Internet scurrying to decode its potential meanings. One resourceful writer for Previously.TV has unearthed a Marty Robbins song, "El Paso," which has a character named Felina. In the song a jealous cowboy kills a rival who was flirting with his love, Felina, in a bar. Two flash-forward scenes have offered clues about what might happen to Walt in Sunday's finale. The cowboy flees town alone before returning for Felina some time later, only to be shot down in a face-off with five unseen men. Felina, says the writer, is a metaphor for Walt's criminal life -- the seductive power he feels when he's earning respect and millions of dollars. Then again, "felina" is also an anagram for "finale." So it may just mean Gilligan is messing with us. Because there's only one thing we can say for sure about "Breaking Bad's" last episode: All our predictions will be wrong. How do you think "Breaking Bad" will end? How should it end? Let me know in the comments. since this point in time i am reading this great educational piece of writing here at my home. I mean a glance) what your site is about. That's what makes it ideal to someone just starting out. I'dbe very thanhkful if you could elaborate a little bit more.